These plants are very distant relatives but are often mistaken for one another. In fact, they also share some common mythic aspects with one another, perhaps as a result of the similar appearance of their flowers. Water lilies actually comprise a large family of many species, several of which grow in the Deitscherei. Add to them the “pond lilies” (en: Spatterdock, pdc: Gehlwasserlilye, tax: Nuphar spp.) and you have a lot of plants that are commonly seen in lakes and ponds in Southeastern Pennsylvania. Far less common is the stunning American Lotus. Its flowers resemble those of the regional water lilies, but the seedpod in the center is distinctive. The leaves of American Lotus are round and complete in contast to the Water Lily, which is rounded but split into a V shape from the stem. Both plants provide excellent cover for fish and attract insects, frogs, and other wildlife. As such, they are seen as aiding in producing the bounty of the water. That being said, though, the stems of both plants make net fishing difficult. While this is obviously a complicating factor for large fishing endeavors, we see a manifestation of the need for the Zusaagpflicht (see Hollerbeer Haven, issues 18 and 20) as it relates to aquatic ecosystems. Anecdotally speaking, there has been a tendency in the past to clear ponds and lakes of aquatic growth in order to ease the difficulty of obtaining large numbers of fish in a short period of time. This is a destructive act to the ecosystem, particularly when one considers the addition of pollutants from irresponsible industrial and agricultural practices. Interestingly, transplanting these plants outside of their natural habitats can result in the plants also being a nuisance. Perhaps due in part to the points above, there is a Verbot (taboo) in Braucherei against the cutting of the stem of American Lotus or the digging up of the root except when it is to be used specifically as food. The stems can be consumed as greens, and the roots are starchy, so the portions of the plant can be parts of a salad. In short, one may fish around it, and one may remove it, but the removal must be done responsibly. 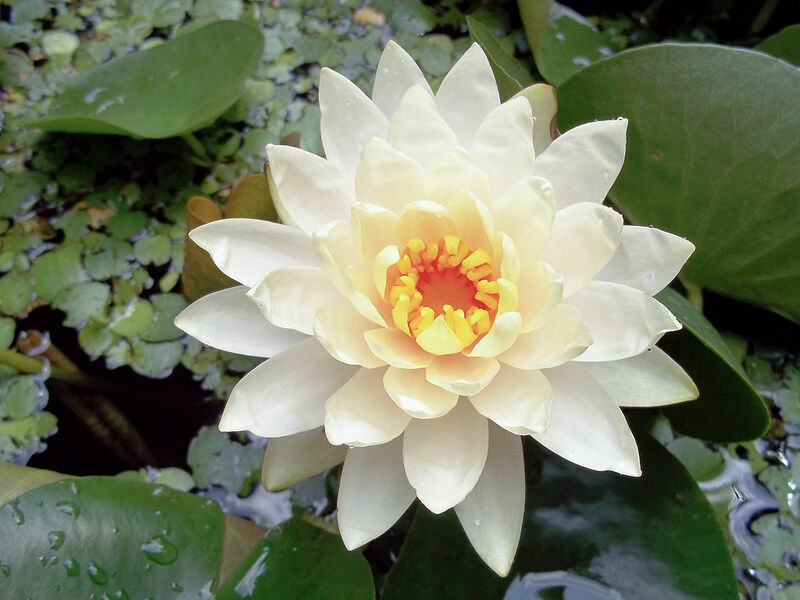 Regarding the Deitsch name of American Lotus, “Wassermann” translates both to “water man,” and “merman,” though the latter is usually covered under the term “Wassernix” (grammatically feminine but physically can be either gender.” “Wasserharr” translates to “Waterlord,” so the full name (Wasserharrsgschenk) of the plant translates to “Waterlord’s gift.” The "gift" is said to be to the "Earth Lady," who is also known in Hexerei lore as Erda. Thus, from the Urglaawe perspective, we may be looking at something that was seen to be related to a deity associated with water. For more on this theory, please see the article, Hoietfescht: A Festival of the Wane and Nature Spirits in Hollerbeer Hof 27 - Summer 2015. It is important to note that there are only two species of lotus in the world. 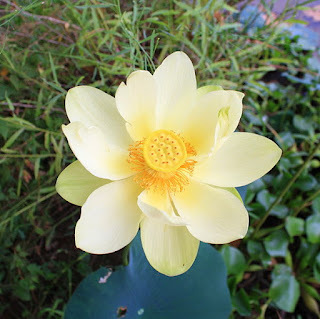 The other is Nelumbo nucifera, native to Asia and sacred in Hinduism and Buddhism. Thus, there is no lotus in Europe, so the sacred association likely arose after migration, and I suspect (but cannot prove) that some of the oral lore was influenced by earlier lore associated with water lilies. Note: American lotus is endangered.